Jarryd is a highly qualified personal trainer with over 4 years experience in the health and fitness industry who has spent the past few years working in a private studio before becoming a member of the MaxNRG team as a mobile personal trainer. Throughout his time as a trainer, athlete and student he has worked with a number of top coaches and teachers and gained valuable experience in a variety of situations. 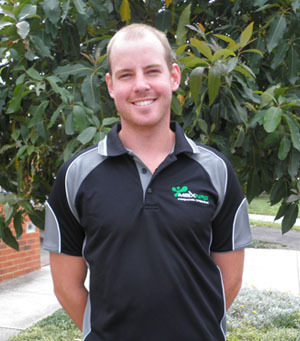 Jarryd is a university qualified health professional that services in Carlton, North Melbourne, Pascoe Vale, Essendon, Keilor, Brunswick, Maribyrnong and the surrounding suburbs. I train at convenient locations for my clients at a time that is suited to them, at local parks or homes in a safe, healthy and fun environment. I have been a qualified and registered personal trainer for the past 2 years. I have a passion for Health and Fitness as it has always been an important part of my life. I have played sports at elite levels which allowed me to work with top coaches and fitness professionals. Having recently completed a Bachelor of Applied Exercise Science & Human Movement I have been able to formulate a unique style of training that is challenging, fun and enjoyable for everyone at all levels of fitness. I believe I have the knowledge and experience as a Personal Trainer to help each individual reach their health and fitness goals. Previously working out of a private studio I am looking forward to further extending my knowledge and continue to challenge myself as a Mobile Personal Trainer. I am a firm believer that if you aim high the sky is the limit to your success.